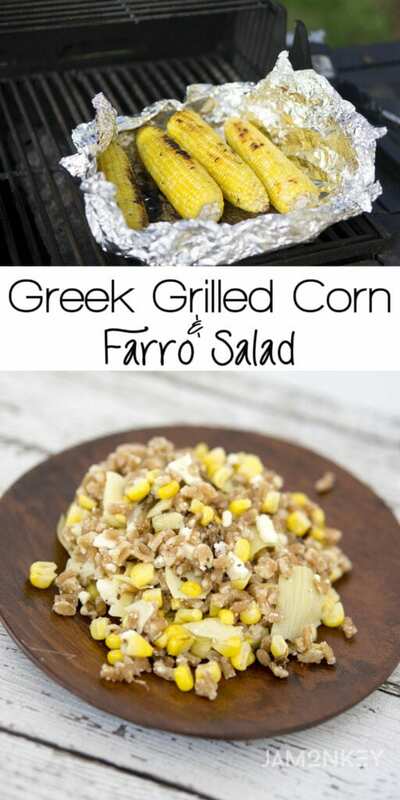 A medley of some of my favorite flavors, this greek grilled corn is cooked on the grill and then mixed in with farro for a delicious summer salad. We love grilling in the spring and summertime once it gets warm out. We go through gas for our grill pretty fast each month. Right now Sunshine Sweet Corn from Florida is in season so we get some each week. Normally when we grill corn we grill it right inside the husk. 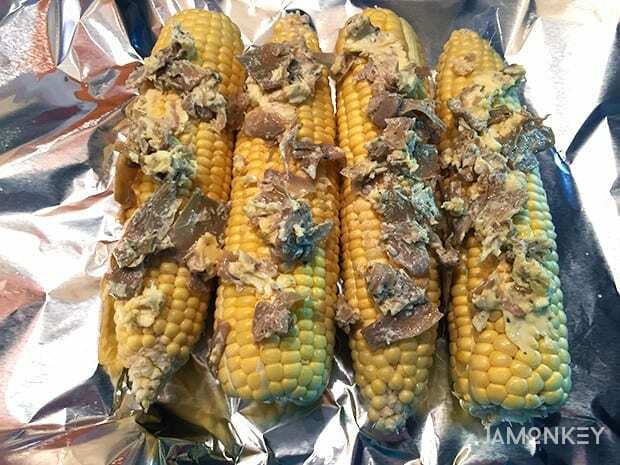 It keeps the corn juicy and won't burn it, but because I'm adding in some other ingredients I'm grilling it inside aluminium foil. 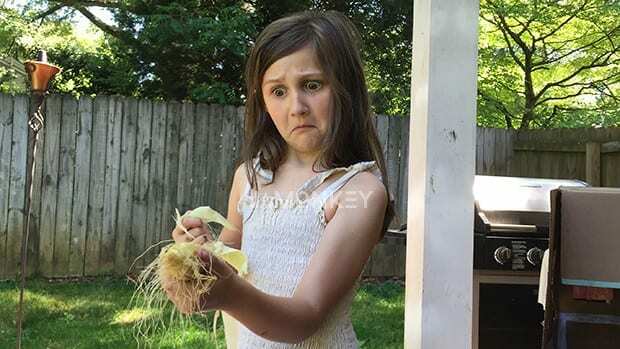 My kids never get to husk the corn because it's too hot from the grill, so I let my oldest give it a shot. It's a fun activity for kids to get involved in the cooking process. It was pretty funny watching her because she made some silly faces during the process. After we were done husking the corn, I prepared the artichoke butter mixture. I mixed softened butter with some greek seasoning and the leaves from the marinated artichoke hearts. I made an aluminium foil bag for the corn to go into and then I spread the mixture onto the top of the corn. Close up the aluminum bag so that the edges are at the top so the butter stays in the foil. Place in the hot grill and turn the corn every 10 minutes until cooked. Times will vary depending on the hot spots in your grill. 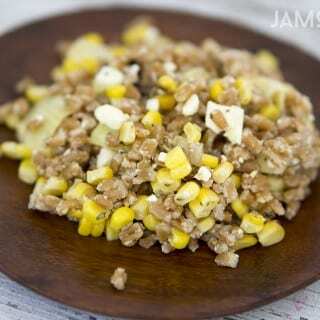 When you corn is done, cut it from the cob into a bowl with your prepared farro. You can add the artichokes that your grilled into the farro as well. Mix in more greek seasoning and olive oil and mix it all up. Allow the salad to cool and then add in your feta cheese and artichoke hearts and mix well. You can store your mixture in the refrigerator until you're ready to eat, making it a great backyard BBQ side that is easy to transport. Right now Influencer Central is hosting a contest for Sunshine Sweet Corn from Florida where you can enter to win one of five $100 Williams -Sonoma Grill Sets! 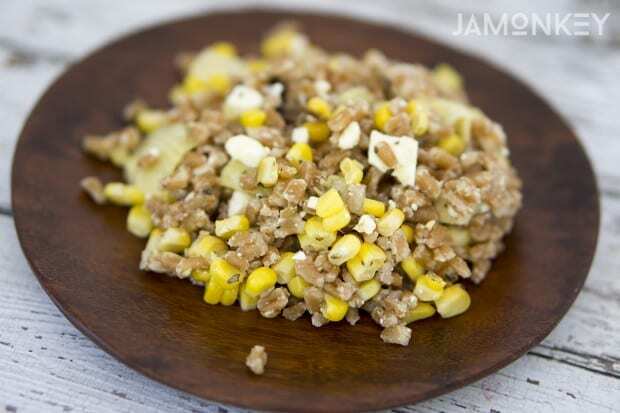 What are your favorite ways to eat corn?